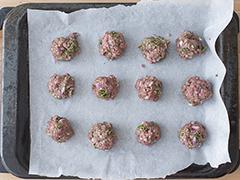 If you want to break out of your meatball rut, koftas are for you! 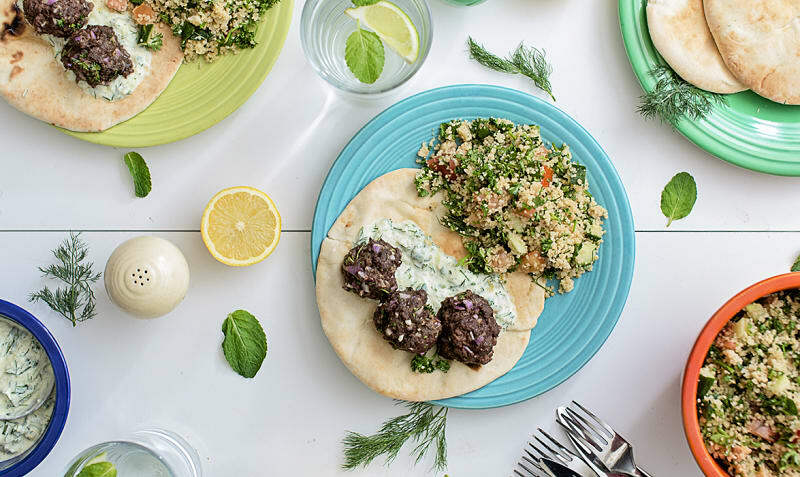 These spiced ground beef meatballs are served with fresh tzatziki, pita, and couscous salad for a delicious hearty meal with a Meditteranean twist! Best prepared within two days of delivery. Preheat the oven to 375°F. In a medium saucepan, combine 1½ cups water, a glug of olive oil, and a pinch of salt and bring to the boil. Add couscous and stir well, then remove from heat and let sit, covered, for 5 minutes. Transfer into a large bowl, fluff with a fork, and refrigerate. 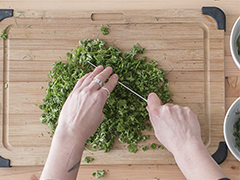 Finely chop the onion, parsley, mint, and dill. Mince the garlic (or crush with a garlic crusher). Cut the cucumber in half, and peel and grate one half using the large holes of the box grater. Place that half in bowl with pinch of salt. 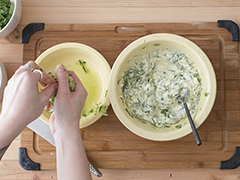 In another bowl, mix the zest and juice of one lemon with the yogurt, ½ tsp of crushed garlic, 2 tbsp olive oil, ½ the dill and ½ the mint, and salt and pepper to taste. Use your hands to squeeze the water out of the grated cucumber and add the cucumber to the yogurt mixture. Mix well, cover, and refrigerate. In a medium bowl, mix the ground beef, the remaining garlic, chopped onion, 2 tbsp of chopped parsley, spice mix, and salt to taste. Mix well with your hands and form into 1½ inch balls and place on a parchment-lined baking sheet. Bake for 15-20 min or until fully cooked. While the koftas are cooking, chop the tomatoes and the other half of the cucumber into similar size pieces and toss together with a ¼ cup of olive oil, the juice of a lemon, and the remaining mint, parsley, and couscous. Toss the pitas into the oven for about 5 minutes to warm up. 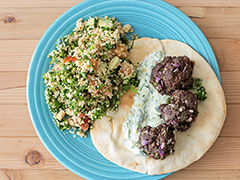 Place a warm pita on each plate, spread with tzatziki and top with koftas. Serve with couscous salad and a lemon wedge.